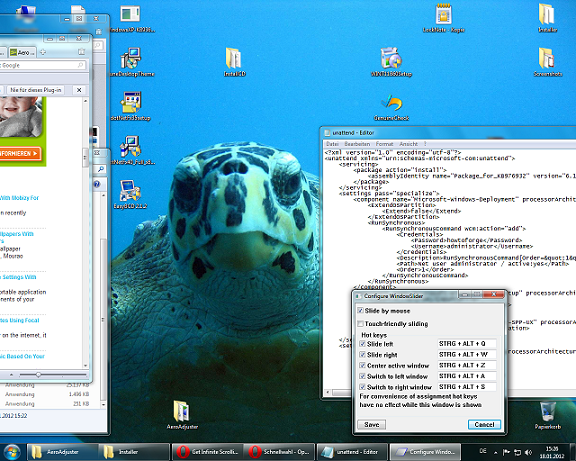 WindowSlider is a useful application especially with older non wide-screen monitors since it allows horizontal scrolling of the desktop, as if there were multiple virtual desktops stuck together giving you an infinite work space (the wallpaper and taskbar are static, only the windows move). It runs as a tray-icon in your taskbar and hast customizable keyboard shortcuts to scroll, but also to jump to active or approximate windows. Furthermore it enables you to scroll by pushing your mouse to one of the side-ends of the screen. All of the above functions are disengageable.